In the previous blog post we saw measures to improve security in maritime industry. In this post, we will take a look at the measures taken on board ships. One of the first steps taken was the installation of Ship Security Alert System (SSAS), a device which sends distress signal in case of piracy, armed robbery or terrorist activity. The beacon works on similar principles as that of Aircraft Transponder Emergency Code 7700, sending information such as identity of the ship and its location to the Company and Rescue Coordination Centers (RCCs). 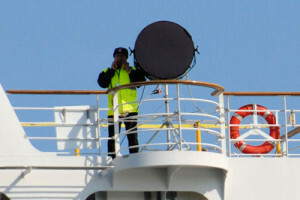 It is mandatory for all vessels to have this device on board. The signals sent are discreet, meaning other ships are not alerted. They do not raise any alarm on board the ship and continue to send the signals unless reset. Thus the attackers remain unaware of the alert system being activated. Years 2007-09 saw rampant rise in piracy attacks off the coast of Somalia and western parts of the Indian Ocean. On 21st August 2008, three merchant cargo vessels Iran Deyanat, Irene and BBC Trinidad were hijacked and their crew and cargo held to ransom. After this attack, the shipping world comprehended the need for armed security guards on board the ship. Pirates tend to come on small skiffs, loaded with AK-47s and scaling ladder as depicted in the movie Captain Phillips from Sony Entertainment. These simple hijackings make a huge dent in the finances of shipping companies. As a result, companies started hiring private, professional armed guards when sailing across dangerous waters. Ships became fortified castles and there was no way pirates could hijack such a ship. Around the same time international governments also saw the need to protect the cargo ships. Today NATO, the EU, Indian Navy and Russian Navy all have warships patrolling the Indian Ocean to curb piracy. 1. Long Range Acoustic Device (LRAD): These are pain inducing sound beams that force away any threat. A few of the cargo ships and many cruise ships use this technology. Security Guards with bullet proof vest man this device. A warning is given prior to using it on any vessel in its proximity. 2. Water Cannon: There are a number of fire lines running across the length and breadth of the ship. These lines have high pressure water surging through them at all times and can be a very effective method to keep the any security threats at bay. Water jets and sprays are employed throughout the periphery of the ship. The stream of water reduces visibility and also fills the approaching boats with water, slowing them down and affecting their maneuverability. These cannons are fitted on almost all cargo vessels. 3. Electric Secure Fence: It is a collapsible fence surrounding the ship with electricity running through it. The pirates cannot climb on board with this system in place. Once the dangerous waters have been maneuvered, the fence can be folded and kept in a safe location. 4. 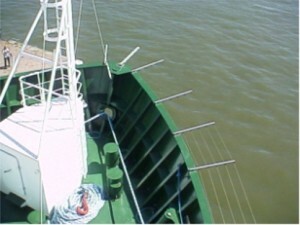 Nets (Boat Traps): Pirates use small skiffs when launching an attack. These skiffs are easy targets if a net is used to trap them. The net gets entangled with propeller blades of skiffs thus rendering them immobile. 5. Slippery Foam: These are similar to detergents used for washing clothes. It makes boarding of the ship through ladders a difficult task due to their anti-friction properties. The deck and sides of the ship are applied with this foam. Security is an ongoing process and latest developments in technology can vastly help in keeping the shipping business safe and secure.